I love this spring—the beautiful weather, good hiking, great climbing both at the gym and outdoors, and playing softball (for the first time in my life). I am on the Killington Deli team, and after a few disastrous early games, things are coming together nicely. I am playing first base (one of my old standby positions, both in baseball and on dates), and I am turning out to be a very reliable hitter and base runner. I won’t go into too much detail, as that is deejay Dave Hoffenberg’s beat, but I am thoroughly enjoying myself . . . the sprinting, the sliding, stop-and-go tension . . . it fits my kamikaze personality perfectly. The only thing I am not truly enjoying is the excruciating pain in my hip flexors from sprinting, but that is relieved very easily by recovery rides on my road bikes. I am hiking nearly daily, and the highlight this week was a six-mile hike up the Sherburne Pass Trail, nothing exciting about the times, but it was just nice to lay down some miles and to do so without any sort of strain or effort. Winter on the cycle trainer and spring hiking up the mountain slopes was the key to that, for sure. I am investigating picking up a crosscountry and downhill bike so that I can start to make things exciting (I find road biking rather dreary, but great for training), I am just unsure of the expense . . . those bikes make road bikes seem like inexpensive toys. But that is for another day. 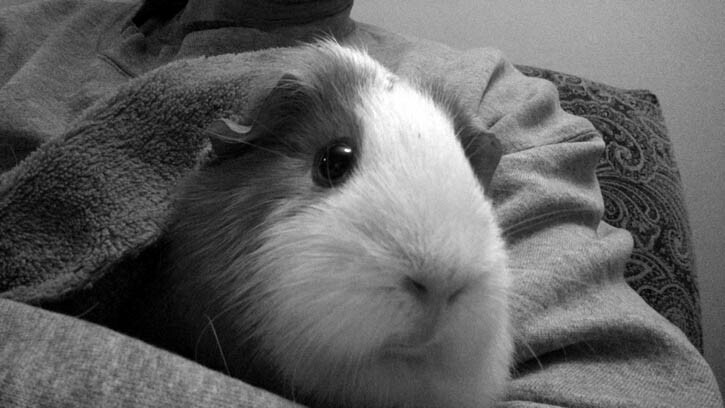 Today, however, we remember the anniversary of the death of my guinea pig Stinky Pete. This was a very hard time for me last year, and by the time you are reading this, it will be very close to the anniversary of the purchase of my new friend Pip (later dubbed Pip the Impaler). The last year has been a journey for sure. Pip turned out to be far more damaged than I would have expected a guinea pig to be capable of, but that just confirms the depth of the personalities of these little creatures. Pip and I have been through a lot of battles of will and neuroses; I have tried everything to rehab him. I have made startlingly little progress. When I got him, his digestive system was inflamed (he pooped orange . . . I’m pretty sure his former owners fed him crayons and ice cream) and it seems like he might have had a urinary tract infection. He was unable to sit still for any appreciable period of time in a snuggle and he bit any time a hand was reached out to him. In the end, what I have had to do is bribe him constantly with sugary treats. Antisocial though he may be, he now at least pursues contact with me because he wants a treat. Furthermore, after a few months of this, the yogurt treat that I bribe him with has rehabbed his digestive system and he is using corners to go to the bathroom and is far more capable of sitting still during contact. When I give him apple or yogurt treats, I pet him while he eats. This has changed things. He has only bitten a few times since the New Year, and he occasionally purrs for me during this petting. If I grab him for a snuggle during one of his naps, he is downright delightful and snuggly. Likewise, when I wake him up in the morning and uncover his cage, he is affectionate and sweet, letting me scratch his chin and throat, and then walking by my scratching finger leaning on it like an old dog and purring like a happy cat. He is even becoming tolerant of the average snuggle. He is by no means the affectionate guinea pig that the sainted Stinky Pete was, but he is far better than I have had any right to hope for given where we started. In February I was considering re-homing him, but the treats started working and I bought a brush to pet him with, which was something he accepted, because it was not a thing that had hurt him in the past. But things are not rosy for my little man. He is slow to trust, and I am slow to patience. I continue to show up, though, and I continue to try to mitigate the damage my fellow humans have done to this little guy. Someday I hope to break through. I have the suspicion that when I do, it will be well worth the wait. But for something to be worth the wait, that requires actual waiting, which I am not so good at. So it seems like Pip is training me, too. Now it’s time for a snuggle before bed.